I have a new favourite hobby. Glamping. 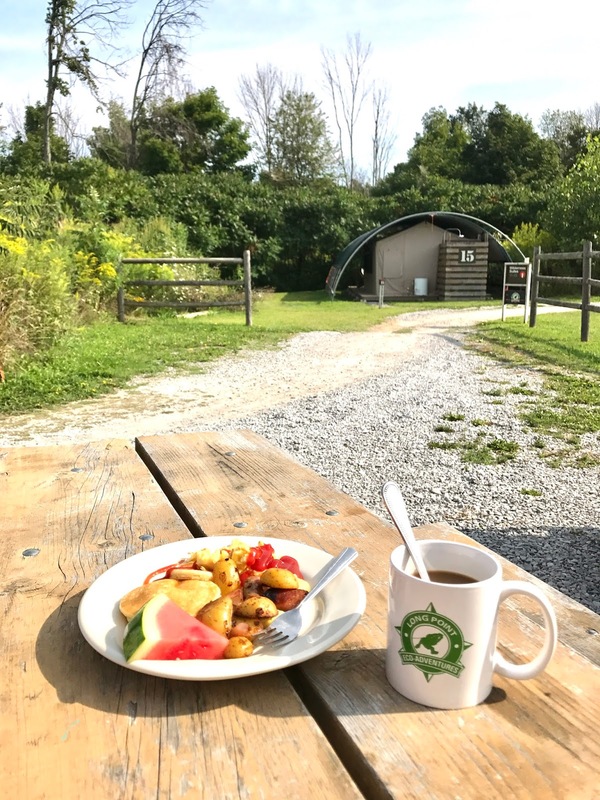 When I saw photos of Long Point Eco Adventures, and their glamping site, I knew this is where I wanted to be. 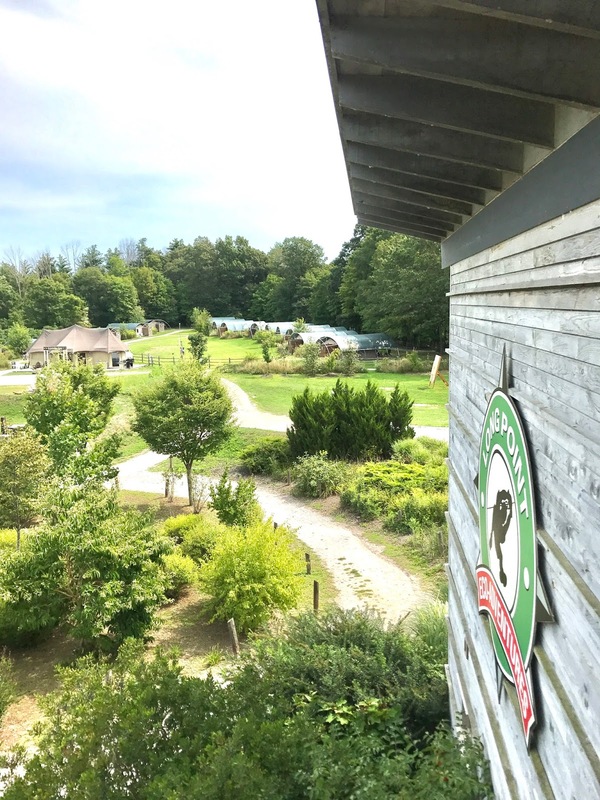 Upon our arrival to Long Point Eco Adventures located in Norfolk County, we were so impressed. What a cute little community. We made our way to the reception building where we were given a leather portfolio with all the information about our stay and the glamp grounds, keys to our wilderness suite (we each got our own) and honestly I felt like we just had arrived at a 5 star hotel in the middle of nowhere. Or was it? Long Point Eco-Adventures is actually not in the middle of nowhere. The camp is designed to feel that way, but is definitely just a short drive from Turkey Point beach and Simcoe. The first time I heard of the term glamping I was rather confused. Essentially glamping is a luxurious if you will way of camping. More glamour, less of your traditional camping experience like using the woods as your toilet or wondering if you will have access to water. 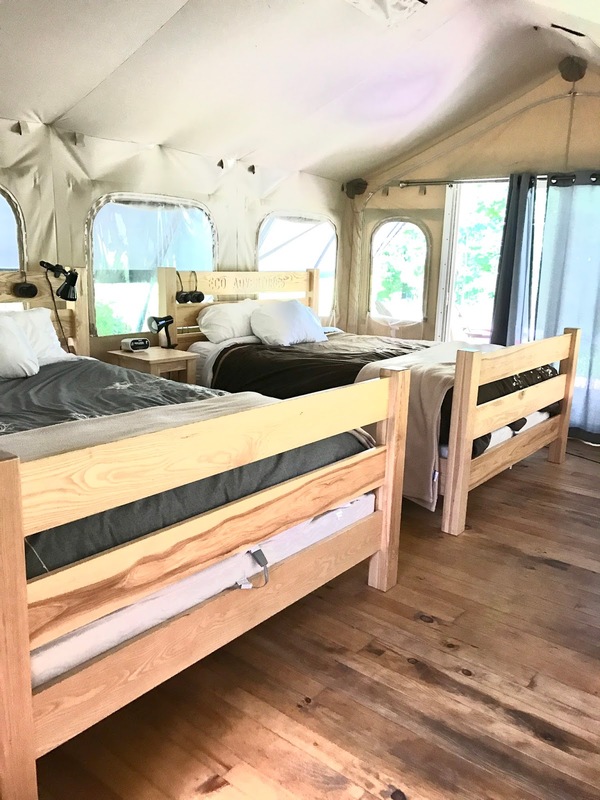 After spending a weekend with Kamiran and Margot at our wilderness suite at Long Point Eco-Adventures, I can say I am 100% a glamping kind of gal. If Margot could speak I am pretty sure she would also confirm that glamping is also much more convenient for her and other dogs. When glamping with your dog, you want to ensure that their daily routine is not interrupted. Margot is very particular about her routine so when travelign we always ensure her schedule remains the same and all of her favourite things are brought with us on the trip. We were so excited to go on a glamping trip to Norfolk, but we also wanted Margot to enjoy the trip as well. So that the whole family has an amazing experience here are some items you need to bring for your pet. Your dog’s bed |You want to make your dog feel right at home while glamping so I highly suggest you bring your dogs bed with you to give them that familiar element. Your dog’s brushes | Twigs and leaves will get caught in your dog’s hair so you want to be able to groom them. Poop bags | Just because you are glamping doesn’t mean someone else will be picking up after your pupster. Do I need to say more? I was relieved that we did not have to sleep on the ground with rocks poking my body. Comfy mattress, a warm comforter, fluffy pillows, even a dual zone electric blanket for the cold night. This is definitely my kind of camping. Forget about gathering water in buckets so you can shower. Glamping has none of that nonsense. 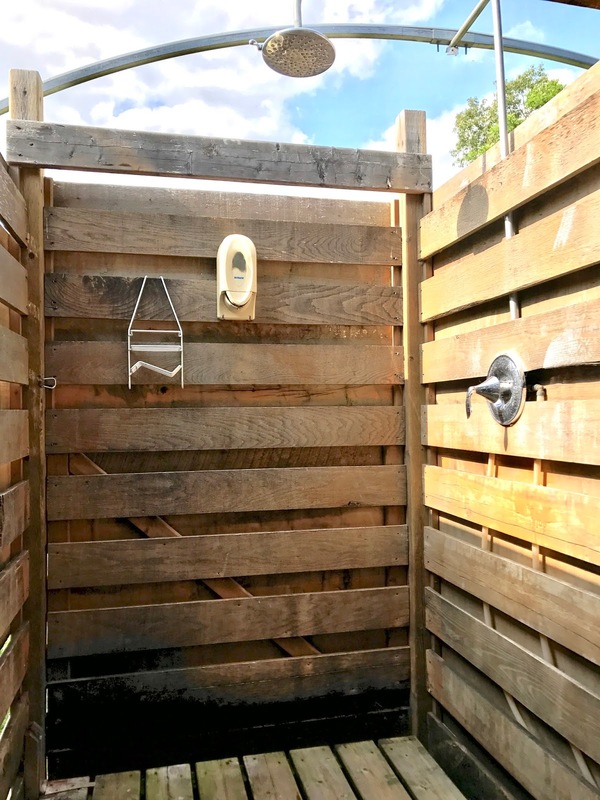 Our wilderness suite not only had running hot and cold water, but it also had a private ensuite bathroom with a beautiful outdoor rain shower and a flush toilet. The bathroom was also fully equipped with eco-friendly toiletries and the coziest bathrobes as well as towels. 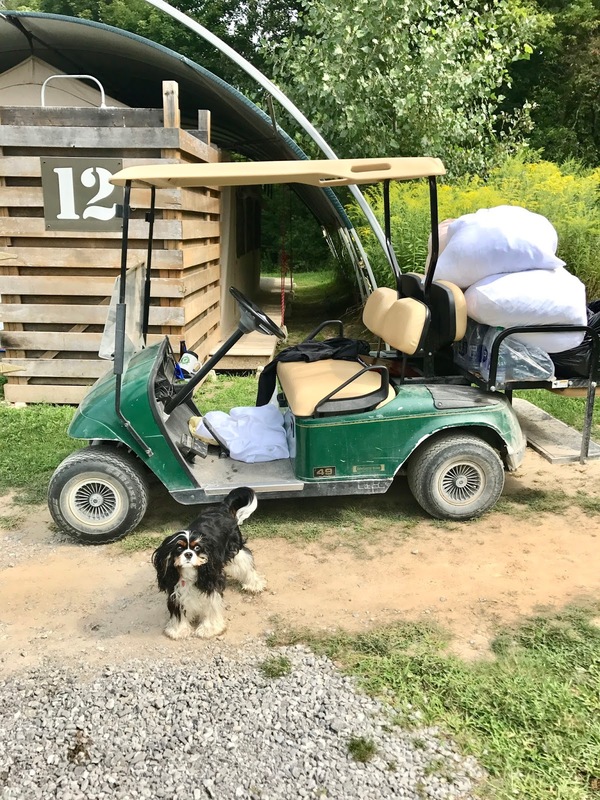 Unlike your typical camping, where you have to pack all of these things from home when you are glamping at Long Point Eco those are details you do not have to worry about. 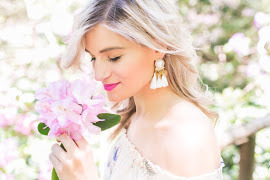 If you enjoy staying connected to the world even when you are glamping then this is the spot! 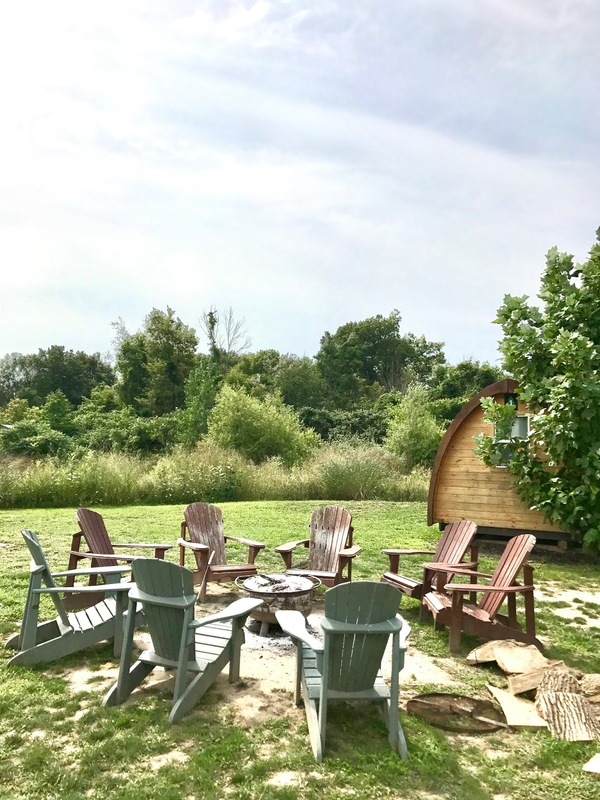 Long Point Eco Adventures has equipped each wilderness suite with Wi-Fi connection and electrical outlets so that each guest can stay connected with the rest of the world and their loved ones back home if you are taking a me time trip away from the kids. We brought Margot with us most of the time when we were exploring the town and around the campsite, but we did leave Margot in our suite for a couple of hours while we headed out for dinner. The suites are amazing because your dog will feel like she is right at home and your mind will be at ease knowing that your suite is locked and there is no way for your dog to get out and get lost around the campground.We filled up Margo’ts water bowl, fed her her dinner, locked the doors, and we were off to our date just as if we were back home. 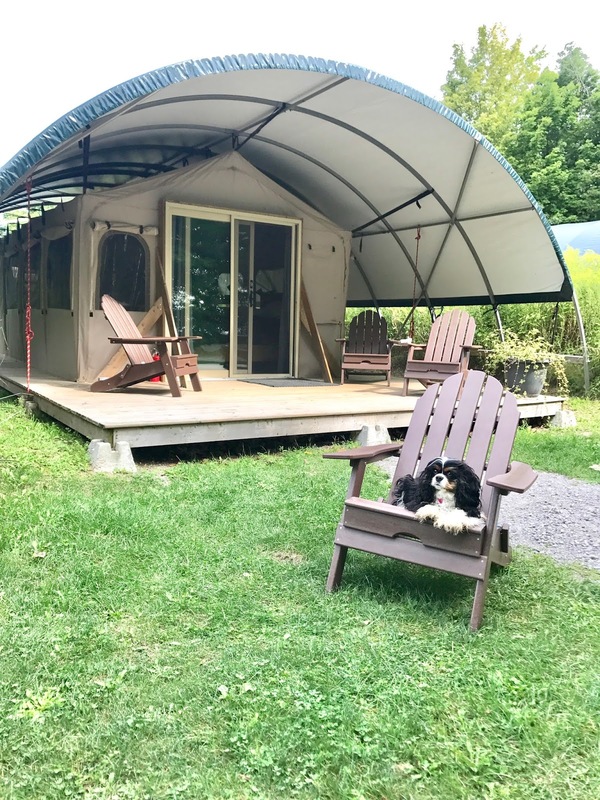 It is so important to not upset your dog by drastically changing their daily routine, and at Long Point Eco Adventures the wilderness suites will help you maintain that routine. Yes there is food, and in fact there are so many options for food near the area that you do not have to worry about bringing any food. I recommend bringing snacks, but other than that you got everything you need just a couple of minutes drive.Did I mention your fridge is also fully stocked with water bottles? 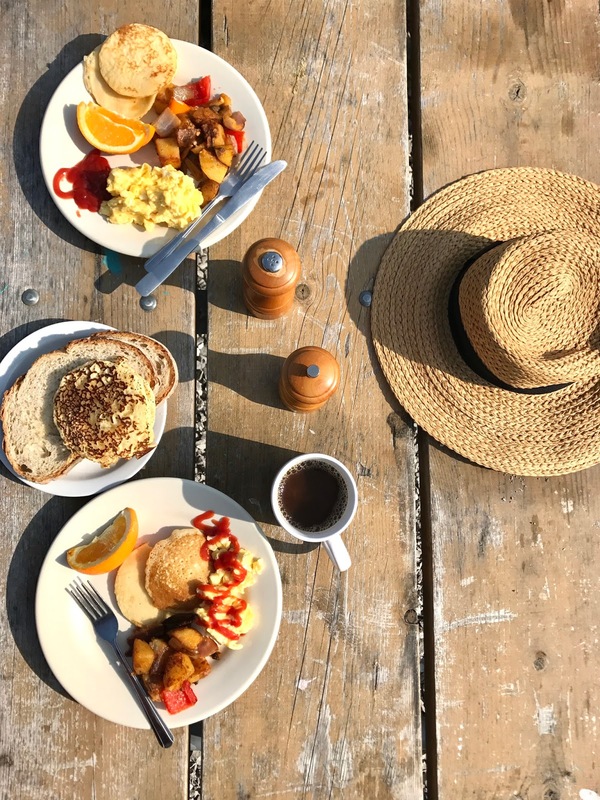 In the morning, there is a complimentary hot buffet breakfast served in a yurt that is set up just for serving breakfast. I loved the fact that there is sitting for both indoors and outdoors. We enjoyed our breakfast at the picnic tables outside since we wanted to bring Margot with us. One of our favourite things to do in the evening was sitting by the campfire. There are multiple campfires around the glamping site but there is a main firepit by the reception building where most guests gather around to socialize and get to know the rest of the glampers. Each evening we got to meet different group of guests that was staying at the wilderness suites; chatting and sipping our glass of red wine that we grabbed from the winery literally across the street. How convenient is that? 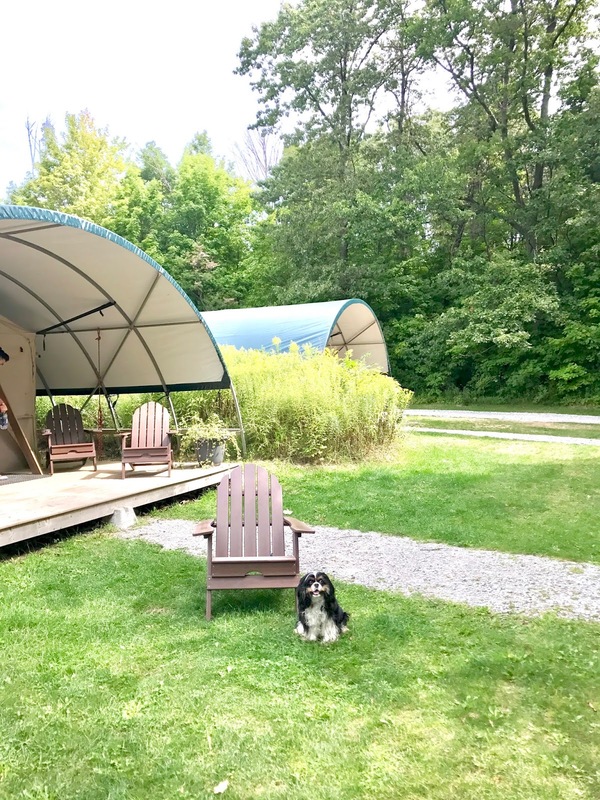 Long Point Eco Adventures is seriously the best glamping spot not just for your pet but for you also. 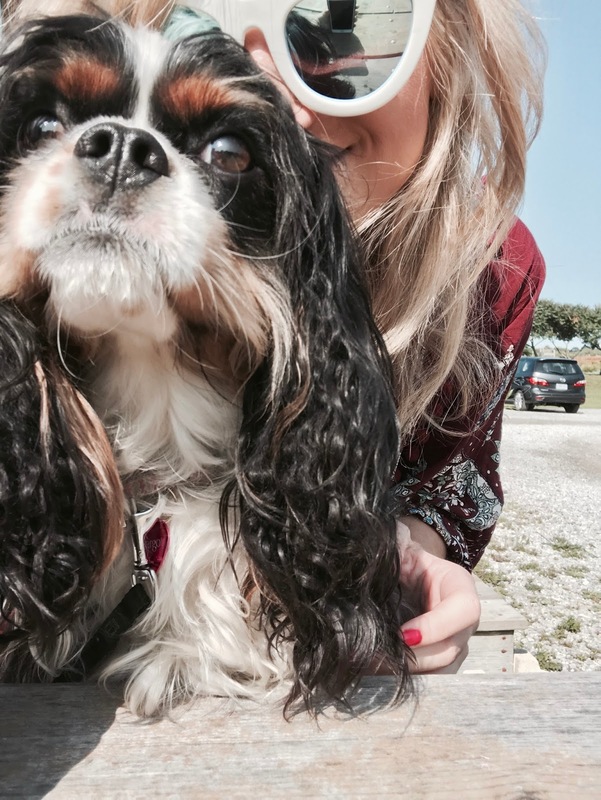 The fee for bringing your dog is just $20 a pet at Long Point Eco which is amazing if you are on a budget. They do ask that your dog remains on a leash in outdoor common areas. We had Margot on a leash most of the time, but when she was out in the field since she is a tiny dog we had her off leash while she was having her daily zoomies. We did not witness any but you are in the great outdoors, wildlife is out there so please do not leave your dog unattended outdoors. Keep a close eye on your dog at all times to ensure your fluffy companion is safe and sound and does not have any run ins with wildlife. 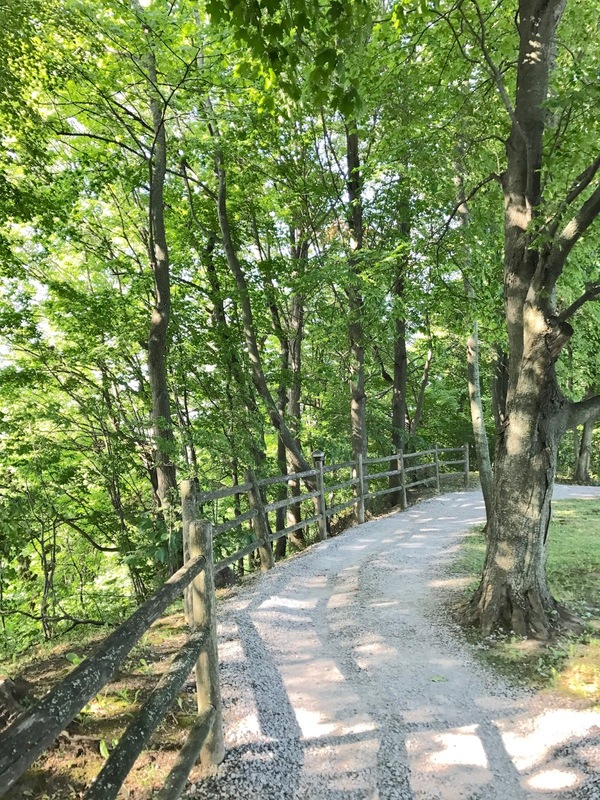 Our suite was situated near the end of the path where the hiking trails begin and next to a steep cliff. I suggest keeping your dog on leash if she is very curious and loves to explore. Yes! 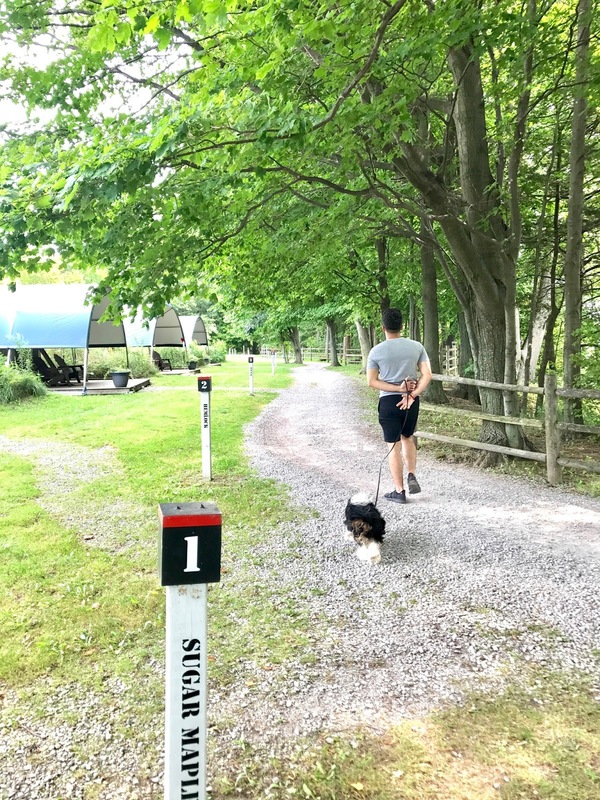 This pet-friendly site overlooking Long Point Eco Bay provides the perfect option for those that are looking to travel with their fluffy companion. The staff is extremely friendly and eager to puppy sit your dog while you are participating in activities around the site. 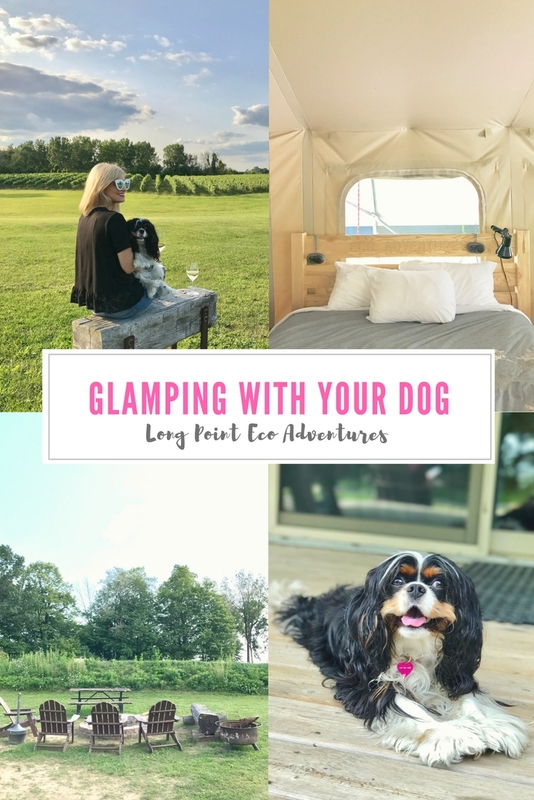 We loved our first experience of glamping with our dog and would definitely love to do it again. Kamiran, Margot and I had the best time ever, we only regret we did not stay longer. Stay tuned next month when I share more details about what activities are available to you while staying at the glamping site and what the surrounding area of Norfolk County has to offer to its visitors. A special thanks to Norfolk County Tourism and Long Point Eco Adventures for hosting us. We had the most incredible time ever and will be back! Life doesn't have to be perfect to be beautiful. This is your guide to finding your everyday sublime.